This vegan cheesecake with raspberries is one of my favorite vegan cakes! It’s super easy to make and unlike many vegan cheesecake recipes it’s baked and not made with cashews. I’ve always loved cheesecake! I would even say it has been my favorite kind of cake before I became vegan. But you don’t necessarily need dairy products to be able to enjoy delicious cheesecake. When I first started to make vegan cheesecake a couple of years ago, I used cashews instead of dairy. I was so surprised how creamy and delicious this vegan cheesecake turned out. I got a couple of cashew cheesecake recipes on the blog if you’d like to check them out. One is my mini strawberry cheesecakes and then I got another recipe for vegan matcha cheesecake. They’re both so yummy! I used vanilla soy yogurt for this vegan cheesecake and I topped it with raspberries. The recipe is pretty easy and you don’t need any fancy ingredients. And boy, it’s SO delicious. I actually like it even better than all the cashew cheesecakes I tried. And you can have more than one slice of it. Haha! I mean that’s a big advantage as well, right? The texture and the taste is so close to the traditional cheesecake I grew up with. It’s so creamy, delicious, and decadent! It’s perfect to bring along to your next birthday party or even for a date. 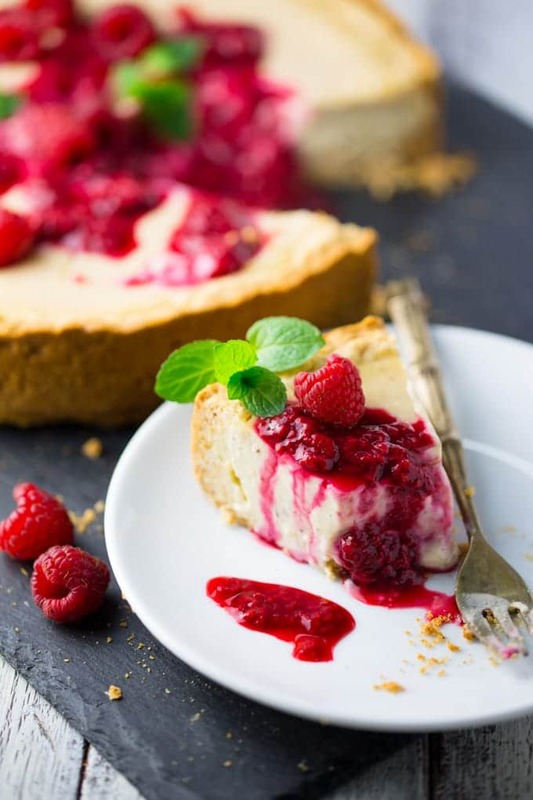 Or maybe make a nice meal at home for Valentine’s Day and make this vegan vanilla cheesecake with raspberries for dessert. I made it for the family when I visited my parents last weekend and they all loved it. They already now that vegan cakes are amazing and you don’t need eggs or milk for baking. But they were still kinda surprised that you could make vegan cheesecake. I mean “cheese”cake, right? But absolutely no dairy needed for this one! As always, it was gone so fast. My dad even went for two extra slices because he couldn’t get enough of it. He sure loves his cakes! Haha! I hope you love this recipe just as much as I do. It’s one of my all-time favorite vegan cakes! 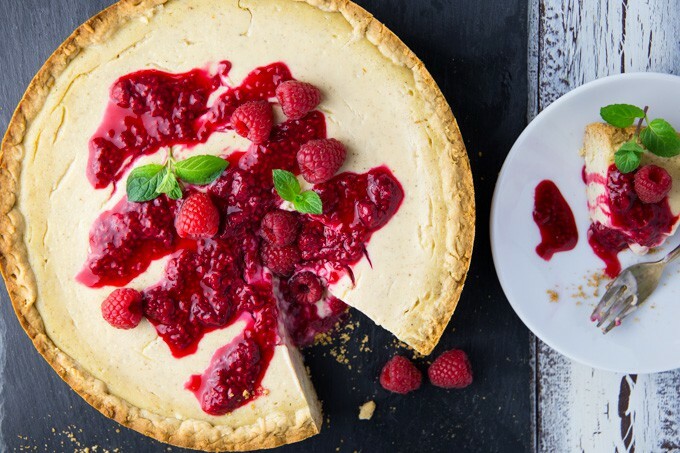 This vegan cheesecake with raspberries is one of my favorite vegan cakes! It's super easy to make and unlike many vegan cheesecake recipes it's baked and not made with cashews. 1/2 cup plant-based margarine It should be soft, so put it out of the fridge about 1 hour before using. Preheat the oven to 350 °F. Prepare the crust: Combine all ingredients in a mixing bowl and use your hands to knead it into a soft dough. Rub the pan with margarine all over the bottom and sides of the pan. Press the dough into the bottom and up the sides of the pan, making a thicker layer on the bottom than on the sides. In a large mixing bowl combine all the ingredients for the cheesecake filling. Beat with a hand-held electric mixer until well combined. Pour in the filling and bake for about 1 hour. Don't worry if the filling is still soft and a bit runny. It will harden once the cake has cooled down. Let it cool down for an hour. Then place it in the fridge for at least 4 hours. Top it with the raspberry sauce, some fresh raspberries, and some mint leaves. Enjoy! Oh my gosh, this looks and sounds amazing, and I love that it looks super doable! This looks so good! Perfect for Valentine’s Day! Love cheesecakes! Even in non vegan kids there are so many ways and kinds of cheesecake. Makes creating them so fun! I love the mint and raspberry combo! Wow, no nuts – what a brilliant and much needed vegan cheesecake recipe! And it looks positively divine. How did you say this on the 27th? Its only the 26th…. magic!!!!!!! I’ve never had cheesecake before in my life!!! I really love that you didn’t use cashews! I have a cheesecake recipe that I love to make using tofu, but I’d love to try your recipe too. Cheesecake is my favourite dessert ever! I could eat it everyday. It’s great that you have created a nut-free vegan version. This is so so so so beautiful! And I love to see a recipe that doesn’t use cashews (they can be so expensive) Gorgeous recipe Sina! This vegan cheesecake looks soo rich and heavenly!!!! Hello, this looks delish. Is it sturdy enough to make with a graham cracker crust just on the bottom instead of a short crust type pastry all-over? I made it and it is very nice, just not sweet enough for my taste. What kind of agave did you use? I made it, it was really ggoid, but my crust started to burn at the minute 20? This cheesecake had such delicious flavor. Our whole family enjoyed eating it. However, it came out a little softer than expected for cheesecake. Could have been because of the ingredients I chose to use. I could not find vanilla pudding powder & used a vegan instant vanilla pudding (in powder form) and used a vegan margarine but maybe I should have used a better one. Will probably make again or try one of your cheesecakes that use cashews. Thanks for sharing your recipes! Please could you confirm the amount of yogurt needed – it says 35Oz and 1Kg! Don’t want to get it wrong. I am planning on making your VEGAN CHEESECAKE (WITHOUT CASHEWS) today with a graham cracker crust. It looks delicious. I have tried two other recipes using vegan cream cheese, Tofutti and Kite Hill. and both had such a bad taste, I had to throw them away. So, I decided to go a different route, and not use cream cheese. I saw your recipe, so I am going to make it today. I am a little confused about the custard powder, i couldn’t find it, so I bought Jello instant vanilla pudding. Thought I would give it a try, but you told someone else to add more cornstarch to make it firmer. How much would I add? I love that this doesn’t have cashews. Where I live they are kind of hard to come by and very expensive. I’ll definitely need to try this one. It looks so AMAZING!! Hmmm I could only find coconut vanilla pudding not soy- would that make a difference? As in coconut milk yogurt! I’m about to make the cake and I would like to ask if I don’t have any agave, can I just like that substitute with sugar or do I need some more liquid? no, you will be fine using sugar instead. :-) Hope you like it. Hi, would it be possible to substitute the agave for maple syrup?? Just made this but the texture was more jello sponge-y than creamy cheesecake. Is that what it’s supposed to be? I measured everything as per recipe! The crust was amazing and the taste of the cake was great but the texture was not. What could have happened? I tried it again and it’s better. Last was coconut yogurt with custard powder and this time was soy yogurt with pudding powder. Hi Do we use liquid or powdered agave? Sooooo GOOD!! This is my favorite vegan cheesecake by far. I love that you don’t have to use tons of nuts for this cake. Can be kinda expensive. I used strawberries instead of raspberries though. Thanks!! This cake was amazing thank you so much for the recipe ! It would also be good to add some berries to the cheesecake mixture before baking I think I will try that out next time. What is the pan size used for this? Thanks!